Puls Power Supplies - Puls Power Converter | PICS, Inc.
Puls has been dedicated in providing Din-Rail power supplies, DC/DC converters and DC-UPS batteries and buffer modules. Their offering includes both single phase and three phase buffering power modules. SilverLine - Reliable power supply that has been produced since the mid 1990’s used for general applications. Has been proven to work over a million times it boasts strong reliability. The SilverLine consists of single and3-phase input Redundant Power Supplies AS-Interface power supplies Redundancy modules. Comes in a durable metal housing, and comes with screw terminals or spring clamps. MiniLine - The MiniLine is durable, efficient, compact, and can be quickly installed. The device is for low power requirements from 15W to 100W. The standard is a 24V but many other output voltages are available. It has a voltage input selection from 100-240 or 380-480VAC. Has an output voltage that ranges from 5V to 56VDC. Compact units feature screw terminals, and standard models come with spring clamp terminals. Dimension – This line ranges from basic products to premium products for more advanced applications. 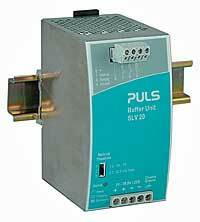 Other items include DC/DC converters, buffer modules DC-UPS’s and many different accessories. This product is completely tailored to your needs. C - Power supplies and DC/DC converters ... Q - Premium class power supplies ... X - Buffer modules and DC-UPS ... U - Three phase power supply for power applications ... Y - Redundancymodules ... Z Mounting accessories. C Series – For efficient applications focused on only the essentials, features a small housing and simplistic usage (DC/DC Converters). A single input version is available for selection and it offers an 115V or 230V choice. There is also a auto-select input choice on top of that. It has a power reserve of up to 20%, and it is able to function at temperatures of up to +113°F. between 60Vac and 300Vac. 50% power reserves give the Q series a leading edge over the other classes. Amazing efficiency over 95%, the Q Series is first in class. U Series – DC-UPS & Buffer Modules - DC-UPS can back up your systems for minutes needing only one 12V-battery or with the battery free buffer module for only seconds. DC-UPS’s and Buffer Modules improves safety and prevents downtime, long restart sequences and loss of data. The DC-UPS also boosts the 12V to a 24V volt level making the life of the 12V battery even longer. If you need back up power during outages or are in need of additional power for peak loads the Buffer Module will handle these jobs. You can also have multiple modules working in unison for increased out-put current or ride-through time. Remote diagnostics are possible through the functions of comprehensive monitoring and signaling. X Series – 3-Phase Power Supplies for Power Applications - The X-series is for motors and various other places where power is needed. Small in size, best efficiency and low in price theX-series only lacks a few features. The model is outfitted with a power down mode during overload situations for protecting the system. Y Series – Redundancy Modules - TheY-series is for isolation of sensitive circuits or for building redundant power supply systems. Redundancy modules can be outfitted with alarm contacts or without.